Members of the Lehava anti-assimilation organization, led by director Bentzi Gopshtain, protested on Thursday night outside the Rami Levy supermarket in Jerusalem's Givat Shaul over the employment of Arab workers at the store. Just on Wednesday a 16-year-old Arab terrorist stabbed two Jewish shoppers at a Rami Levy branch in Mishor Adumim to the east of Jerusalem. Apparently he was aided by an Arab employee of the store who gave him the knife he used to moderately wound the two. Likewise the Givat Shaul branch is close to neighboring Har Nof, where a synagogue was targeted in a horrific attack with hatchets, knives and guns last month that left five dead, and was perpetrated by two terrorists, one of whom was employed at an adjacent grocery store. The Lehava protesters on Thursday complained that the security guards at the store prevented them from demonstrating and even attacked one of them. "They tore up our signs but despite that the protest continued," one of the young demonstrators told Arutz Sheva. Lehava has been holding a weekly demonstration outside the store to protest the employment of Arab workers given the security threat proven in recent high-profile attacks. Gopshtain responded to the crackdown on the protest on Friday, saying "I would have expected from Rami Levy, who was interviewed in the media and explained how liberal and enlightened he is and how important it is for democracy to employ our enemies, to act in the same way with his Jewish brothers." "It's our right to hold protest rallies in front of the supermarket, and if Rami Levy thinks that blows will deter Lehava youth, a complete surprise is waiting for him - they will continue to come until Rami Levy stops his policy and fires the terrorists that work at his store," said Gopshtain. "I again call on Levy: employ friends and not enemies." The security threat posed by Arab workers has been raised recently given the fact that several prominent attacks were committed by terrorists employed near the site of their attacks. Ashkelon Mayor Itamar Shimoni decided last month to limit Arab construction workers on sites near kindergartens, with Jewish protesters demonstrating in front of the Rami Levy branch in Givat Shaul and other sites in support of the decision. However, the decision was later weakened to allow the workers on site in the afternoon once the children went home, following an outpouring of criticism. Economics Minister Naftali Bennett (Jewish Home) went as far as to claim 99.9% of Arab citizens of Israel are loyal to the state. 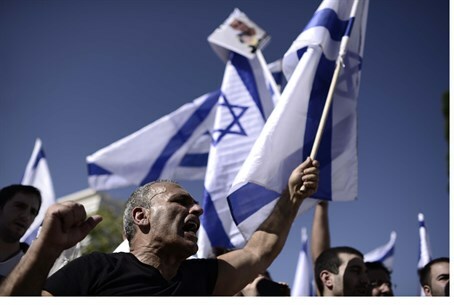 That figure was debunked by a recent poll, which showed 29% of Arab citizens of Israel blamed the state for the recent wave of terrorism, meaning a third of Israeli Arabs gave tacit approval to terrorism.